The Grads of 2010 - are you ready for your big day? Graduation season has rolled around again, a rite of passage in the lives of students at every level. This is an occasion which most definitely merits flowers! The Flower Pot has the perfect graduation bouquet to present to your favorite hard-working student, to make them feel extra-special. If you can't attend the ceremony, be sure to send a Floragramme card to let them know how proud of them you are - included with this gorgeous vase of 12 sunny yellow roses (or any other order). Once the hard part is over (i.e. exams), it's time to celebrate, all in the name of Prom! You've got the date, the dress, the hair - don't forget the flowers! Tradition dictates that The Girl present a boutonnière to her date, and The Guy should decorate his beautiful date with flowers to match her beauty - or at least her dress. He can do this one of two ways - with a wristlet or a corsage. 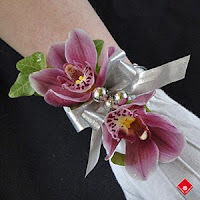 Guys, a wristlet is the safest choice - if she's wearing a strapless gown you won't have anywhere to pin a standard corsage - plus no risk of accidentally making a hole in her dress or pricking her with a pin! Simple instructions, and we know you'll have a great time. Congratulations once again to the Grads of 2010! Have a ball!